Final Update: So I fell asleep and slept right through my alarm, so my 11pm update is accurate. 3 books completed for the readathon and I am very happy with that! I will definitely participate again if I can clear the weekend plans. UPDATE 11pm: A great few hours of reading while the pups snored away! Going to try to start book 4, but may end up taking a little nap! 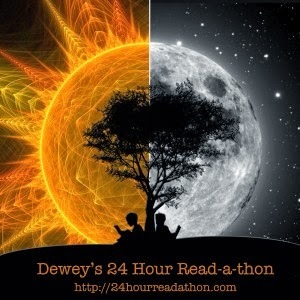 Hoping to wake up early and finish the 24 hrs reading! 4. Did you have to make any special arrangements to free up your whole day? just moved errand running to tomorrow! 8. What would you do differently, as a Reader or a Cheerleader, if you were to do this again next year? I would like to be more prepared with snacks and books! 9. Are you getting tired yet? not yet! may need to take a power nap! UPDATE 6pm: I have eaten dinner and spent time with the husband before he heads off for a shift. Once he is out the door, it will be non stop reading for a few hours, if the pups will agree to some quiet time. UPDATE 2pm: I have eaten lunch and moved outside to enjoy what little sunshine we may have until the rain begins! Still reading The Unfinished Child, but should finish in the next hour! Mini Challenge: 6 words: Perfect reason to read all day! I am about to go make lunch, going to try to keep up the reading while making lunch! A little last minute decision this morning, cleared the calendar and going to read all day and maybe night! Thankfully I have plenty to read! I am reading from my grandfather's chair in my home library! I am starting the readathon by finishing The Care and Management of Lies by Jacqueline Winspear, but I am excited about my next book - The Unfinished Child by Theresa Shea. I have some popcorn on the agenda, but since I am late to the game, I may have to rethink my dinner plans - pizza? I participated in the readathon a long time ago and ever since have always had a packed weekend, so excited for a day devoted to reading! I will be posting more updates and things on my instagram and twitter - @kdurham2. Will post a final recap tomorrow morning.